For a farmer like James Rebanks, who goes by Herdwick Shepherd on Twitter, his sheepdogs are essential to keeping his farm running smoothly. And lucky for Rebanks, he just got 10 new little helpers. 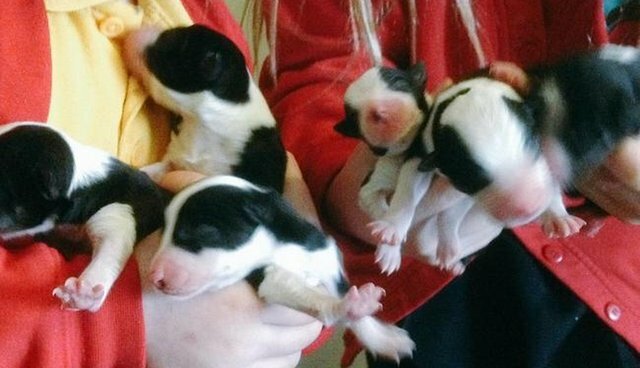 Rebanks' beloved sheepdog Floss gave birth to 10 puppies on Thursday, and he live-tweeted the whole thing. It started, of course, with an announcement. PUPS COMING RIGHT NOW! DON'T PANIC! The first two pups were born right away, and Rebanks had no idea how many more were on the way. After pup number 5, things started getting a little chaotic. Even though the pups were brand new, they were already on the move. And Mom was already tired before all the pups were out. Finally, all 10 were born! Check out that amazing lineup. Some of the puppies will stay on the farm with their Mom and Dad, while others will help out on nearby farms. But before they can learn how to be sheepdogs, they have to open their eyes! Congratulations to Rebanks and Floss, and have fun with those puppies!